Perhaps the most common question I get from readers contacting me is on the subject of just how old a particular box of crayons is. Over time, I figured this out by comparing pictures from periodicals, price lists and catalogs to determine when Crayola used a particular design on their boxes and when they switched that design for another. The Ornate: This design was used on their crayon boxes from 1905 to 1928. Most likely your box will be in the range from 1910 to 1928 as the first five years was used exclusively for the No 8 box and has an Eagle on the Gold Medal and not two people. There are further age clues based on whether the box says "Paris" or "USA" on the bottom front. The USA one is the newer of the two variations and didn't start until 1919. The Triangle: This design was used from 1928 to 1933. There were two variations. One where the flap has a similar design around the box number and one without. The one without is the newer and didn't come out until 1932 which means it was only around two years and therefore isn't one you'll find surfacing that often. The Cyclone: This design was a short lived design that lasted only one year: 1934. That doesn't mean it is necessarily rare as I've seen a fair amount of these surface over the years. The Octogon: This design was used from 1935 to 1940. There are two variations to help age these further. One will mention "USA" and one will not. They dropped the "USA" in 1938. The Square: This was used from 1941 to 1945. I actually named this one incorrectly as it should be a rectangle but the key is that it is fairly similar in design to the Octogon versions except they squared off the corners instead and they dropped the large "C" and "A" on the Crayola and used uniform letter size. The Arch: This design was used from 1946 to 1949. The GM (Gold Medal): This design was used for many years. It ran from 1950 to 1956 and there were three different variations along the way. The earliest two were before Binney & Smith (now Crayola) incorporated in 1955 and therefore had "Co" instead of "Inc" on them. But the earliest of those two did not have a registered trademark symbol above the Crayola name. That was something they added in 1953. Also important is the introduction of the "chevrons"; those angled lines on each side of the front of the box. The Oval: This design was used for a very long time. It ran from 1956 to 1978! In those 22 years with that particular logo, they had many variations. 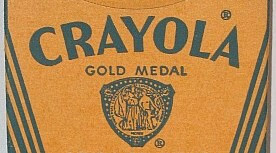 If the Crayola name was arched then those were the earliest of this design running from 1956 until 1965. There were two variations. The earliest (1956 to 1961) will not say "Non-Toxic" on the front while the later does. After 1965 they switched over to a non-arching Crayola name for the rest of the years. There three variations of that design too. The earliest (1966 to 1969) will mention New York on it. The one without it ran from 1970 to 1976. The very last variation added reference to the size of the crayons on it and ran from 1977 to 1978. The Wavy: From 1979 to 1987 Crayola used a different logo on their boxes. Over the course of that time they went from a very thin font style with the Crayola name to a very thick version. The thin version ran from 1979 to 1984 and the other from 1985 to 1987. The Trap: By the latter part of the 1980s, the company split up their crayon boxes. Those bound for retail had hanger tabs on the top of them (except for the larger sized boxes) and those going to schools or sold commercially continued with the traditional tuck boxes. The newly created hanger tab boxes came with a trapezoid window on them that allowed you to see the crayons. Designs with this window get confusing because they used these windows for a lot of European boxes that doesn't necessarily correspond in date to their main Crayola line in the USA. Similarly, specialty boxes started to come out. Many of the Fluorescent boxes used a trapezoid window on them; even tuck boxes. Anyway, this core design on the hanger tab boxes ran only in 1987 before they moved to a new design altogether. The DTC (Development Through Creativity): From 1988 to 1989 they were experimenting with a whole new logo on their boxes that never really took off and they dropped it in 1989. But during their redesign, they also went to a much brighter green color on the boxes and this was the transition from the older color hues to the more current modern color hues. The retail version with the hanger tab also switched over to a "smiling face" open window from the trapezoid version. The Thick: From 1990 to 1996 they stuck with a very basic thick font on the Crayola name to identify their crayon boxes. During this time, the hanger tab boxes had variations of what they said in their upper right. The earlier ones would save "Different Brilliant Colors" and the latter ones "Non-Toxic". The latter ones not showing up until 1992. The Rainbow Underline (RU): This design ran from 1997 to 2002 and came with several minor variations to help break down the age of the box. If it had big green lettering for the number of crayons in the box then that version ran from 1997 to 1999. After that they switched to red lettering. The Smile: In 2003 they went with the fact that their window showing the actual crayons looked sort of like a smile with crayon teeth and they designed a mock window looking just like that. They also added a crayon squiggle logo to their boxes. The squiggle logo only lasted until 2005 but the smile logo continued up until current day. The Rainbow Smile (RS): It's a bit confusing but they introduced a variation incorporating the smile and the rainbow into a design that first appeared in 2003 and was used on various crayon lines clear up to current times. This wasn't, however, used with their standard No 8,16, etc. The Preferred by Teachers: On several of their core sizes such as the No 8, 16, etc. they went with a design that used a "Preferred by Teachers" on it. There were two variations of this. The first was in blue and ran from 2006 until 2011. The next was in red and ran from 2011 until 2014. Of course, there will be more changes in the future to add on to this guide and among different sizes such as the large boxes there are different aging clues. Similarly, their other brands and crayon lines have their own distinctions or exceptions. But these serve as a good guideline for general age across their product offerings. based on your article i have a box of 64 crayolas with sharpener from the 1966-69 era. how can i be sure? For the older boxes of 64 crayons from Crayola, I did a separate article on the main www.crayoncollecting.com website. You will find it under the Crayola section and it has pictures of all the early boxes and the years they were available. That is the only way to be sure. As I have stated in various posts and articles, I know these dates based on price lists, advertisements and catalogs. I put all that information into a chronological order. It is hard to estimate true end dates of a design run because old stock can sit on shelves for years sometimes. Hope that helps. 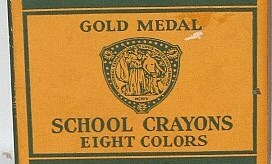 I have a box of Crayola crayons No.12 square/rectangle school crayons - Gold Medal - Twelve colors - made in the U.S.A. - one side of the box says Made in 50 Colors - the other side says Good In Any Climate. Back is printed An Artist's Crayon At Scholar's Price - PERMANENT - WATERPROOF - Will Not Rub Off OR Soil the Hands or Clothes. Idea on the year? email is baxter_716@yahoo.com. Thanks. Thank you for the information, found exactly what I needed. I have found a box of 6 Crayola Crayons with the Binney & Smith logo. In small red lettering it says: "Gift of Johnson's baby shampoo" and under this it says "Not for Resale". Just found it interesting. Thought I would add more information from me. I am an elementary school art teacher in Florida. I started with Crayola Crayon Collecting when I bought a set of 120 crayons. I made a chart about 4 feet long of every color in the 120 count set using my own "vision" from yellow at the top and then down through all of the colors. I found the 150 Crayons box and had to do the same thing, much bigger chart. All of my students and teachers think it is strangely wonderful to see all 150 crayons. I have added a separate page of construction paper colors, and then fabric crayons. I just found some Mixed up colors and ones from Caraba's Restaurant and so forth. Love all of the information on this page - just amazing! !